Keep the PMC tightly wrapped until ready to use. For long term storage, seal it in a plastic bag with a dampened tissue. Apply a thin layer of olive oil to hands and tools before working. Avoid drafts and lamps that will dry the clay as you work Tools for shaping PMC include ceramic tools, rubber stamps, cookie cutters, and many household items like pens, playing cards, toothpicks, combs, etc. Use water to seal joints and smooth surfaces, but be careful not to add too much. Refresh PMC at the end of a work session by adding a few drops of water and rewrapping in plastic film. Small scraps can be moistened and saved as paste. Dry the work, either at room temperature or with the heat of a lamp or hair dryer. You can use PMC just about anywhere, but a stable, well-lit area is best. A table or desk is ideal. A sheet of plastic or a kitchenware lid makes a convenient work surface that allows you to rotate the work easily. Avoid using cardboard because it will draw water out of the clay and stiffen it. For this same reason, avoid working in a draft from a heater, air conditioner or fan. A thin film of olive oil on the fingers prevents the PMC from sticking to the skin and seals its surface against dehydration. Other useful tools are a plastic rolling pin (such as a piece of PVC pipe), a razor knife and a small burnisher. Various pencil-Like tools can be devised from toothpicks, skewers, chopsticks, popsicle sticks and scribes. You might find yourself collecting bits of fabric, plastic and wood to take advantage of PMC's wonderful ability to pick up textures. Before handling PMC, put a couple drops of olive oil in your palm and rub your hands together to cover them with a thin film. This prevents the clay from sticking and seals the surface of the material to inhibit dehydration. Unwrap the PMC, pinch off what you need for the next couple minutes and rewrap the rest to prevent it from drying out. Precious Metal Clay is sold ready to use and does not need wedging or other preparation. Sheets of PMC can be made by "patting out" a wafer, but a more uniform result can be made with a rolling pin. Any cylindrical objects will do-a section of plastic pipe about an inch in diameter and 6-8 inches long is a convenient size. Sandwiching the clay between layers of plastic wrap or a plastic bag during this process slows drying and makes it easy to lift the sheet off the table. To create a sheet of specific thickness, run the roller along spacers set up on either side of the lump as shown. These can be of plastic, metal, wood or mat board. It's handy to have several thicknesses, or try stacking them for greater variety. Strips, bars and square wire are made by slicing pieces from the sheet with a razor knife. To make a round wire, roll a lump of PMC in the palms of your hands to form a thick "snake." To reduce further, set the clay on a smooth, flat surface and roll it under a flattened palm as shown. You'll quickly discover the appropriate pressure and motion to create wires and tapers to suit your needs. PMC can be mixed with water to create a thin paste that can be painted, cast and dipped. It is a convenient material for repairing cracks in drying PMC, and is recommended to reinforce joints. A "slip jar" makes a practical way to reuse PMC crumbs; drop them into a jar and add a couple drops of water at the end of each working session. This way you'll have some slip ready when you need it. PMC slip can be cast into a plaster mold but the mold must be sealed to prevent the PMC from sticking. To dip cores into PMC, secure a wax-covered core to a thin wire and lower it into a thin slip. Allow this layer to dry and redip as needed to achieve the desired thickness of PMC. A similar effect can be achieved by painting the thinned clay onto 3 form or delicate texture. Conventional stoneware clay can be pressed into PMC either before or after the Precious Metal Clay has been fired. The two materials will often fuse, but a mechanical grip is recommended to ensure a strong bond. As shown here, the PMC can be either the base or the added element. PMC offers possibilities for metal inserts or repairs in previously fired ceramic ware, subject of course to allowable firing temperatures. PMC can be thrown on a potter's wheel just like earthen clay and will create a vessel with all the finger marks and textures characteristic of ceramic ware. It is also possible to attach PMC elements to a bisqued ceramic piece to create precious metal details such as rims, medallions and handles. You'll notice that your Precious Metal Clay arrived wrapped in plastic film and sealed in a box to keep it fresh. Don't expose the clay to air until you're ready to use it, and then only pinch off what you can use in a couple of minutes. For long-term storage, set your boxes of PMC in a zipper-locked plastic bag with a small bit of dampened paper towel. Kept this way, PMC can be used as much as a year after purchase. Left exposed, it will harden overnight. A word about the date stamp you'll see on the package: PMC does not "go bad” after the stamped date, but this allows you to rotate your stock intelligently. Once hard, it's possible to restore the clay to its pliable state, but it's difficult to make it quite as smooth as when new. 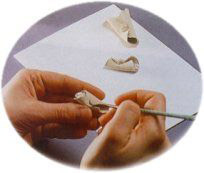 To rejuvenate dry clay, make numerous cuts into the block or pierce it repeatedly with a needle, then submerge the lump in water for a few seconds. Wrap the wet lump in plastic, allow the clay to absorb the water for a couple of hours, then knead the lump through the plastic. Regardless of the consistency of PMC, its metal content is unchanged and can be retrieved through traditional refining techniques. Precious Metal Clay has been certified by an independent testing facility to be safe in every phase of its use and to conform to ASTM 04236. 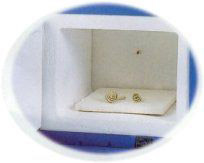 Issues of safety arise not from PMC, but in the normal use of the high-temperature furnaces used in the sintering process. These kilns should be positioned on a stable surface, away from combustible materials. Never leave a kiln unattended and take special care if animals or young children are in the area. As always, when working around heat, wear appropriate clothing, avoiding clothes made of synthetic fabrics. There is little reason to stare into the kiln, but if you need to do this, protective lenses should be worn. One of the most exciting qualities of PMC is its ability to capture impressions. In most cases the clay is simply pressed against the textured object or the object is pressed into the clay. Textures with deep under-cuts should be avoided because they will tear out when the clay is being pulled away. If for some reason the clay sticks to the texture, try laying a piece of plastic wrap over the texture first. If the texture is too delicate for this solution try spraying the texture with a thin film of cooking spray (e.g. PAM@). Remember that some textured items can be burned away in the firing process. As an example, it might be easiest to press a leaf into PMC and simply leave it there when the piece is set into the kiln. All that will remain of the leaf after sintering is a fine ash that can be easily brushed away. In many cases, connections can be made by over-lapping pieces of PMC. Often the pieces are simply layered into position and lightly pressed together. If the clay is starting to dry, add a tiny drop of water with a brush at the edge of the overlay. When a situation offers less contact, dampen the two surfaces to be connected with a drop of water and texture them with fine lines using a blade or point. Press the pieces firmly together and rub the surface to hide the seam. This process can be used on rods and on the edges of sheets. A variation of the usual way of working PMC involves creating a form that is then carved to achieve crisp detail. Dry the form in a medium oven (250°F) for at least 10 minutes, then allow it to air-cool. The material will be "leather hard" and can be worked with carving tools and burnishers. Precious Metal Clay can be refired several times with no problem. Because of this, the clay can be used to make repairs on other PMC objects and in other heat-tolerant materials as well. If a joint fails, press fresh PMC onto the cleaned surface and refire to create a new joint. 1. The materials must remain unharmed at the temperatures from 1470 to 1650F. 2. The embedded object must be clean; impurities will compromise the bond with the clay. 3. Wherever possible, arrange a mechanical grip to supplement the fusion of metal to metal. For instance, if a panel of gold was being pressed into a silver sheet, the edges of the panel should be angled to allow the shrinkage of the clay to press down on and "capture" the plate. Copper and brass can be mechanically bonded to PMC like this but will not fuse because of the oxide films they produce when heated. 4. Many embedded materials are damaged by rapid cooling, so allow the finished piece to air-cool after sintering. Precious Metal Clay lends itself to the creation of hollow forms such as beads, cups and large pendants. A core is created of a material that will burn away, and the clay is built up and modeled around it. During heating the combustible core literally "goes up in smoke," which passes safely through the pores of the still-forming metal. This allows completely enclosed forms to be made. Cores can be made of papier mache, cellulose and expanded plastics such as Styrofoam~. Particularly in the case of the latter, ventilation will be required because an unpleasant odor and dangerous fumes are likely to result. Alumina can be mixed into the papier mache to create large cores that will dry faster and burn up more easily. In the sintering process, the alumina is released and simply falls loose into the kiln where it is easily retrieved. 1. Create a form from a combustible material. Its size and shape will determine the interior space of the silver piece before shrinkage. This core can be made by molding or carving, depending on the material. 2. Rollout sheets or wires of PMC and press these onto the core. If the clay doesn't adhere to the core, coat it with wax by dipping the core into a cup of molten wax. The PMC is then modeled, carved and textured as described previously. 3. Set the form on a bed of alumina, using a sagger box for larger forms as needed and heat in the usual way. When the firing is complete the pieces may be finished as usual.